Nick Matzorkis was a serial entrepreneur, always looking for the next big idea. The latest one came to him in 2008 when he was stand up paddle surfing in Malibu, California. Today stand up paddling is the fastest growing water sport in the United States. Back then the sport was found mostly on the coasts. But Matzorkis, now 50, had ideas. SUP as it is called, features a surfboard like board designed to be stood on, with a one-bladed paddle that the paddler alternates from side to side. Advocates like it as a whole-body workout engaging the core, the arms and the legs. The boards are stable, so that novices can pick up the sport fairly quickly, although water conditions and design advances continue to make it interesting to even the most experienced paddlers. Not to mention the benefits of exercising outside and the Zen of feeling as if one is walking on water. Because the person on the board can propel him - or herself forward with the paddle, as a kayaker does, SUP can be enjoyed on flat-water lakes and even subdivision ponds, in addition to moving rivers and in ocean surf. And that is where Matzorkis saw his opportunity. Matzorkis is a southern California native who now lives on Lake Austin in Austin, Texas, and understands the Texas boating and outdoor culture. Matzorkis wanted to make SUP accessible to people who don't live on the coasts. So, in 2008, he set himself a modest goal: to become the largest flat-water paddle board company in the U.S. By 2009, his first paddle boards were in production and he had reach his goal. His company, SUP ATX (the name is drawn from the sport and the Austin location) nos is one of the largest paddleboard makers in the world known for its high-volume value-priced equipment, offering an affordable product to those who don't live on the beach and don't necessarily aspire to surf culture, but like the idea of being outdoors and being healthy. "We wanted to popularize the sport, not just for surfers, but for everybody" says Matzorkis. In 2008 Matzorkis spent $5,000 buying his first two paddle boards, paddles and associated gear, an aount that is not atypical in the industry even today. With SUP ATX, his aim was a price point of less than $1,000 per person. 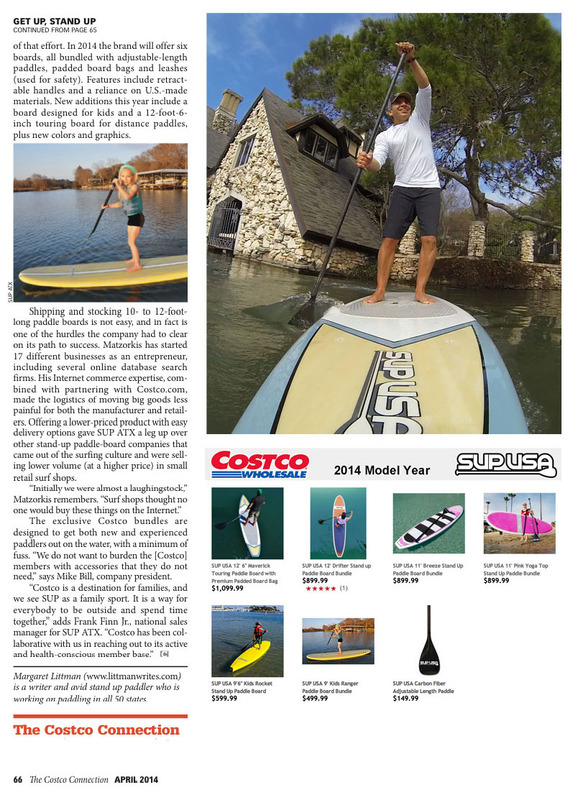 In 2010, SUP ATX launched its SUP USA line exclusively at Costco.com as part of that effort. In 2014 the brand will offer six boards, all bundled with adjustable-length paddles, padded board bags and leashes (used for safety). Features include retractable handles and a reliance on U.S.-made materials. New additionas this year include a board designed for kids and a 12-foot-6-inch touring board for distance paddles, plus new colors and graphics. Shipping and stocking 10- to 12-foot-long paddle boards is not easy, and in fact is one of the hurdles the company had to clear on its path to success. Matzorkis has started 17 different businesses as an entrepreneur, including several online database search firms. His Internet commerce expertise, combined with partnering with Costco.com, made the logistics of moving big goods less painful for both the manufacturer and retailers. Offering a lower-priced product with easy delivery options gave SUP ATX a leg up over other stand-up paddle board companies that came out of the surfing culture and were selling lower volume (at a higher price) in small retail surf shops. "Initially we were almost a laughingstock," Matzorkis remembers. "Surf shops thought no one would buy these things on the Internet." The exclusive Costco bundles are designed to get both new and experienced paddlers out on hte water, with a minimum of fuss. "We do not want to burden the [Costco] members with accessories that they do not need," says Mike Bill, company president. 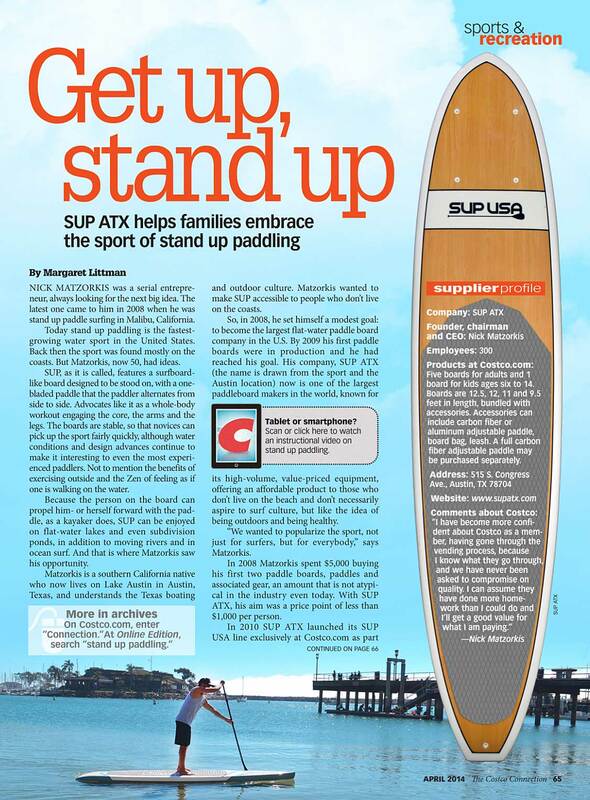 "Costco is a destination for families, and we see SUP as a family sport. It is a way for everybody to be outside and spend time together," adds Frank Finn Jr., national sales manager for SUP ATX. "Costco has been collaborative with us in reaching out to its active and health conscious member base."